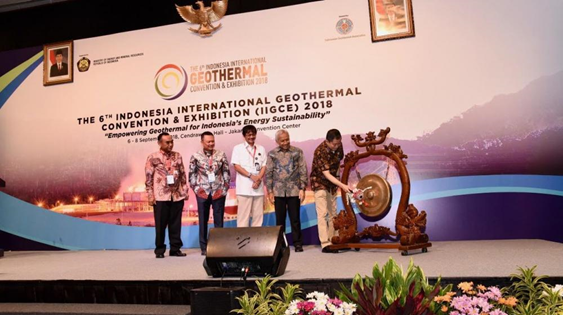 Jakarta - Minister of Energy and Mineral Resources (ESDM), Ignasius Jonan, today, Thursday (6/9) officially opened the event "Indonesia International Geothermal Convention & Exhibition (IIGCE) 2018 at the Jakarta Convention Center. Activities taking place starting on the 6th until September 8, 2018, the theme was "Empowering Geothermal for Indonesia's Energy Sustainability". The presence of the Minister of Energy and Mineral Resources in this activity is one of the Government's proof of attention to the development of geothermal energy as a potential source of clean energy in meeting energy needs in the country. At present, Indonesia's geothermal potential reaches 28.5 Giga Watts (GW) which consists of a total reserve of 17.5 GW and a resource of 11 GW. While the installed capacity of the Geothermal Power Plant (PLTP) is currently at 1,948.5 MW. Until the end of 2018, it is expected that the PLTP capacity will increase to 2 GW with the entry of several plants that are currently in the completion stage. In his remarks, Minister Jonan said that the development of geothermal energy must be accelerated, and various projects were immediately executed, so that the geothermal installed capacity target was 7,200 MW and the EBT mix of 23% by 2025 could be achieved. - Assignment of BUMN to develop Geothermal Work Areas. - Assignment of Preliminary and Exploration Surveys to Business Entities. - Reducing the risk of exploration with the Geothermal Fund mechanism and Government Drilling program. - ESDM Regulation No. 33 of 2018 concerning Management and Utilization of Geothermal Data and Information for Indirect Use. - ESDM Regulation No. 37 of 2018 concerning the Offer of Geothermal Work Areas, Giving Geothermal Permits, and Geothermal Exploitation Assignments. Director General of New and Renewable Energy and Energy Conservation (EBTKE) Rida Mulyana added that realizing the commitment to accelerate geothermal development needs support and joint collaboration, not only the Government but also businesses, associations, and academics. By organizing IIGCE 2018, the Government expects that there will be innovations and other breakthroughs to accelerate geothermal development in the country. IIGCE 2018 presents discussions on geothermal technology innovations from the surface to subsurface, upstream and downstream, both by the Government, business actors and international practitioners. With a target of more than 500 delegates and 5000 visitors to participate both at home and abroad, the Chair of IIGCE 2018, M. Ikbal Nur expects this event to be a sustainable tradition for the geothermal community as a venue for discussion on various challenges in geothermal development, as an event to share experiences and expertise for mutual interests between industry, academia and government.